Nov 10, 2015 We are committed to providing high level services and support to clients and recruits. We recommend complaints are filed through the proper channels by speaking directly to our team. 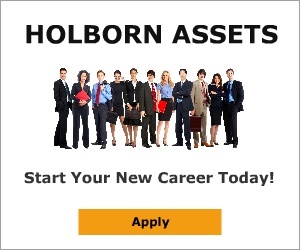 I contacted an advisor of Holborn Assets back in 2009. I was advised to put a large amount of money in bonds with Friends Provident International. It was supposed to be low risk, earn around 10% a year and easily cover fees of the bonds. As part of the investment, I also needed money placed on a short term deposit account. I was completely mis-sold this latter part as they placed it as part of the original bond and so it attracted early redemption fees, admin fees etc for a simple savings account I could have opened personally anyway. And the admin and support was appalling. So many mistakes and conflicting advice. No follow up, no original documentation received. Then to top if all off last year (2013) one of the main schemes they advised to invest in turned out to be one of the many scam and fraudulent investments run by Peter Drake. Any advisor with half a brain would have seen these investments were dodgy but all they wanted was the very very large commissions. Now they ignore letters of complaint and have basically lost me masses of money. Review #476806 is a subjective opinion of rgawith.